"Hasbara" Bullying: How Low Can They Go? Alas, I cannot respond because the bully blocked me. I felt ill when this was forwarded to me, because I consider an attack on my character as an act of war. Disagree with me if you will, hell, call me names. But don't lie about me. How monstrous to use one’s sick wife to garner support for an unrelated issue of disagreement dealing with matters which affect the entire Jewish nation. And how monstrous it is to try to demonize me, when anyone who truly knows me, will understand that I love every decent Jew. Even some of those who would stone me. Even David Lange who believes I am his enemy, and has more hatred towards me than he does fore Hananya Naftyali. First things first. The entire administrative staff is distraught over David Lange’s wife’s illness. We wish her a complete refuah shleimah (ad meah v’esrim) and our thoughts are with her during our tefilot. Heaven forbid that we should feel otherwise. And it is shameful that David Lange would so egregiously mischaracterize my actions and attempt to demonize me, because of a disagreement on an unrelated issue. 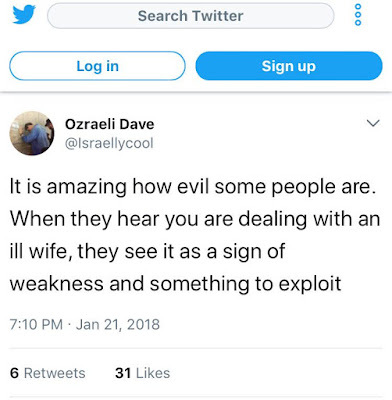 I was prevented from responding to David via Twitter (where I intended to offer my best wishes for his wife’s health), since as I noted above, he blocked me from his account. I wasn’t going to bring up his wife’s illness on a public blog, but at this point when he hit below the belt in a most egregious fashion, I have no choice. David Lange is upset that I called Israellycool weak and nebbish on the issue of tackling missionaries. Perfectly reasonable that he would, considering his perspective is light years away from my own. Different sides of the playing field. He chooses to ignore Kay Wilson’s messianic past and Ryan Bellerose’s obnoxious, racist behavior. Fine. All of it is documented and we are not concerned with threats of lawsuits. 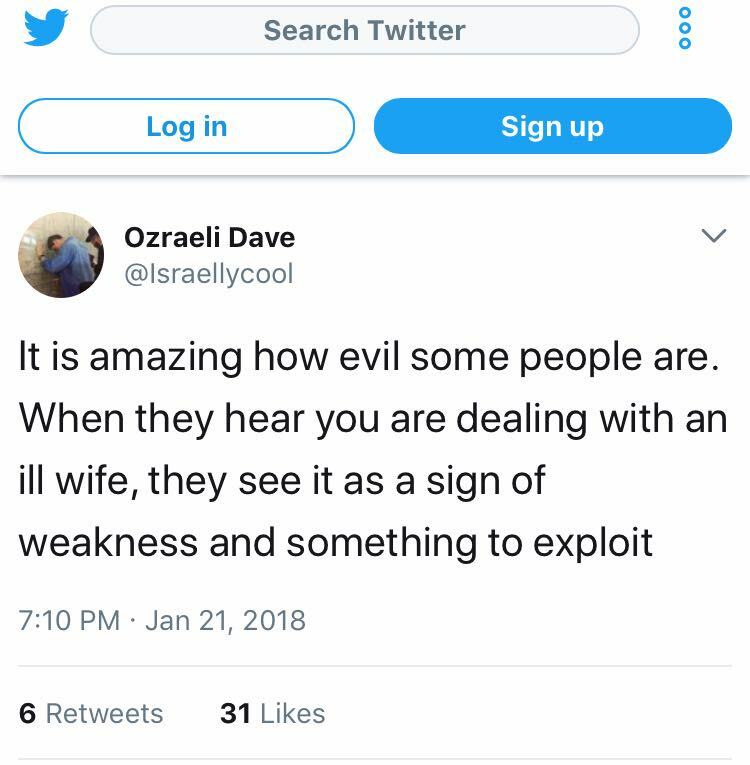 But to accuse me of taking advantage of his wife’s illness? Shame on you.